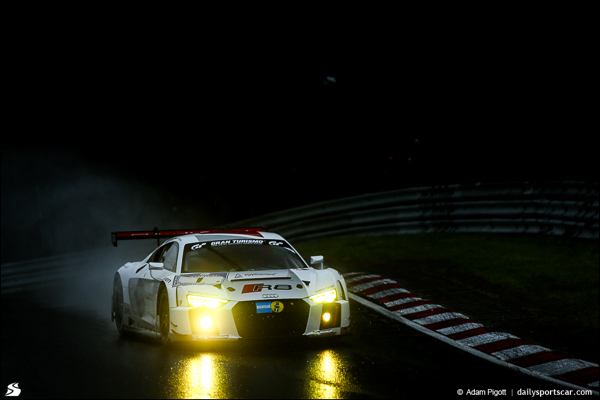 The 2014 race-winning crew wound up fastest after Thursday’s night qualifying for this weekend’s Nurburgring 24 Hours. 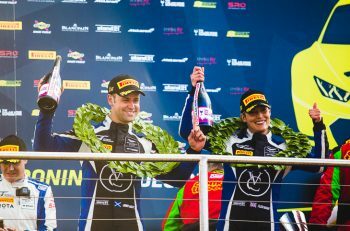 The session saw the target laptime drop gradually as the track dried out following a spell of heavy rain, and then after a furious series of improvements in the dying seconds, the #1 Phoenix Racing Audi R8 finished on top. 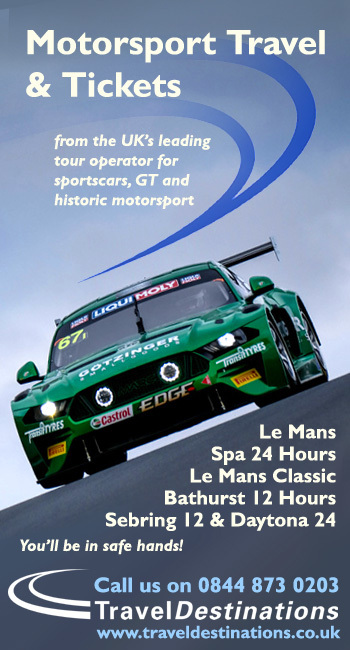 With the rain coming down in the early stages, the fastest cars on track were struggling to break the 10-minute barrier. It was after 9pm, about 90 minutes into proceedings, that #26 Marc VDS BMW clocked a 9:48.745 courtesy of Jorg Muller. Over the next hour, the new Audi R8s hacked seconds off the optimum time, with both the WRT and Phoenix entries getting in on the action. The #28 WRT of Mies, Sandstrom, Muller and Vanthoor did a 9:12.744 just under three hours into the session, but then the advantage swung back to BMW. Schubert BMW man Dirk Muller shaved nearly another 10 seconds off the benchmark about 15 minutes later, indicating how quickly the track was drying out. The fastest time then rapidly tumbled towards the 8:30 mark as the final hour of qualifying ticked past, with Jorg Muller in the Marc VDS BMW coming back to the fore, with an 8:43 and 8:37 in quick succession. 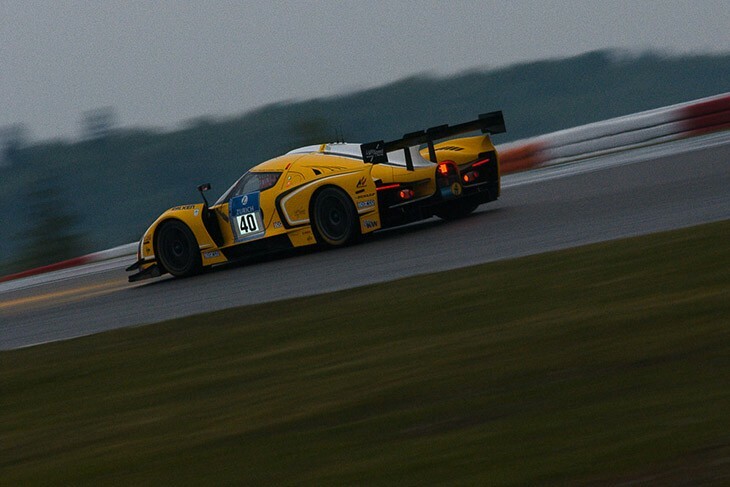 The latter lap (an 8:37.183 to be exact) remained unchallenged until shortly before the flag fell at 11:25pm, when the #006 Aston, which had literally kept its powder dry during the earlier rain, stormed around in 8:32.701, kicking off a series of last-gasp efforts from the quickest cars. The #29 WRT and #1 Phoenix Audis – and the #25 Marc VDS BMW – banged in fast final laps on a much less busy track than before. Last year’s race winners Haase, Mamerow, Rast and Winkelhock ended up at the top of the pile courtesy of a very rapid 8:29.806 at the flag. The final order saw the #1 Audi just thousandths of a second ahead of the #25 BMW (8:29.895) with the #29 WRT R8 slotting in third on an 8:30.185. This was backed up by the sister #28 WRT machine in fourth, with even the #006 Aston’s last-lap heroics only being enough to put it fifth in the session. The #26 Marc VDS BMW wound up sixth, ahead of the #007 Aston, while the #4 Phoenix Audi, #2 Black Falcon Mercedes and #11 HTP Bentley completed the top 10. Elsewhere, Alex Buncombe confirmed that the Nissan GT-Rs are currently managing the speed-limit zones manually, as the car’s electronic limiter has proved to be too harsh on the gearbox and not accurate enough, occasionally letting it too slow or too fast for the restrictions. This was clearly illustrated when the car had its fastest qualifying times deleted for exceeding the limits. The second part of regular qualifying takes place tomorrow at 9:30am local time, with the Top 30 shootout set for 5:10pm. 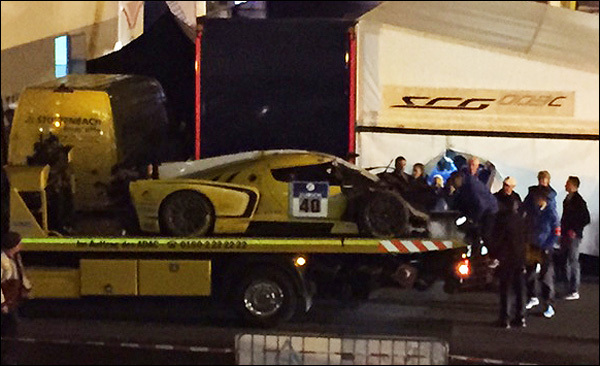 STOP PRESS – The #40 Scuderia Cameron Glickenhaus SCG003 is a confirmed withdrawal after Ken Dobson shunted in night qualifying at Post 131 at around 200 km/h. The team have confirmed this morning that the car is beyond immediate repair, Ken Dobson was taken to the circuit medical centre for precautionary checks but was released soon afterwards. One other consequence of the withdrawal is that the #40 car was one of the 18 cars already prequalified for the Top 30 qualifying shootout.